Arthur Ray Devlin (known as Ray), miner, waterside worker and union organiser, was born on 17 March 1926, at Burnie, Tasmania, one of eight children of Llewellyn Max Devlin, a waterside worker, and his wife Sarah Ellen, née Holmyard. He was educated at Burnie State School, leaving at the age of fourteen, and giving his age as nineteen to work underground at the Electrolytic Zinc (EZ) Company's Hercules mine, Williamsford. After four and a half years of mining, Devlin was employed by the post office before obtaining a job, in 1950, on the Burnie waterfront alongside his father. It was hard labour carrying potatoes and rolling paper, and became part-time if no ships docked. Between jobs Devlin worked as an apprentice painter. He continued on the waterfront for thirty-three years until entering the Senate in 1985. A keen member of the Waterside Workers' Federation (WWF), Devlin took over as honorary secretary of the Burnie Trades and Labour Council (BTLC) in 1966, following the road death of his predecessor. In his capacity as secretary, he represented other unions without full-time organisers, including the Federated Liquor and Allied Industries Employees' Union. Appointed a life member of the WWF (later the Maritime Union of Australia) in 1985, he was also a life member of the Transport Workers' Union, the Federated Engine Drivers' and Firemen's Association (FEDFA), the Operative Painters' and Decorators' Union and the Construction, Forestry, Mining and Energy Union. As BTLC secretary Devlin clashed with Brian Harradine and the Tasmanian Trades and Labour Council (TTLC), which set up the Burnie Trades Union Council in opposition to the BTLC in December 1973. By 1979 a number of Tasmanian unions and trade union councils had disaffiliated with the TTLC, and in 1980 they established a state-wide rival body, the Tasmanian Trade Union Council (TTUC), headed by future senator John Devereux. ACTU mediation reunited the Tasmanian union movement in 1983, and the TTUC was dissolved in the same year. However, at the time of Devlin's retirement as secretary ten years later, the BTLC remained an independent 'provisional council in its own right'. The BTLC had an early reputation for using its union muscle, notably the imposition of a year-long ban on fuel to the Ringarooma Tin Mining Company (1974 and 1975). Devlin participated in disputes at Rosebery, Luina, Renison Bell and Savage River; the strike at EZ's Rosebery mine in 1983 established him as 'an important link to the union movement nationally'. He was a powerful and effective negotiator, who was also willing to act on behalf of those, such as pensioners and the socially disadvantaged, with non-union grievances. While giving employers 'curry' in the early days, Devlin eventually won acceptance as a mediator, and was respected for his fairness. Incompetents and drunkards received no assistance. He later described his position as BTLC secretary as 'a 24-hour a day job, and often I was out of bed at two or three o'clock in the morning'. Joining the ALP in his youth, Devlin served as secretary of the Emu Bay branch; a member of the left faction, he was appointed to the Tasmanian State Executive in 1973 and served for the next eight years. Rejecting earlier possibilities of state parliamentary candidature, Devlin stood successfully for the Senate in December 1984. He believed that federal Parliament, and especially the Senate, required 'a few down-to-earth working class people'. During his time in the Senate Devlin continued to fulfil his administrative and negotiating roles for the BTLC. He took a close interest in the cause of inadequately paid and overworked parliamentary staff. When Parliament House catering workers went on strike in 1986 Devlin supported their cause with 'passion'. Devlin spoke infrequently in the Senate. He pointed out that it was difficult at first for a working man to compete with the glib professional men who controlled proceedings. Gradually he became more confident. In his first speech to the Senate on 17 April 1985, Devlin discussed the negative impact of technological change on the waterfront, citing reduced employment opportunities, and industrial accidents (including the death of his brother months earlier). He criticised the practice of paying overtime to workers at the expense of the unemployed. He also condemned the Gray Liberal Government in Tasmania for its intervention in the management of Bass Strait shipping, arguing that cutting services had resulted in social disruption and job losses, and threatened the viability of private commercial shipping enterprises. Among the few topics that Devlin raised consistently in the Senate were the forest industry and repatriation issues. In November 1987 he argued in favour of intensive management of Tasmania's forests, and the development of wood fuel as a sustainable energy resource, as ways of ensuring continued employment and job creation. Devlin was particularly concerned that returned servicemen and women should continue to be provided with adequate domiciliary nursing and hospital care. He repeatedly pressed the Minister for Veterans' Affairs about the entitlements of Australian prisoners of war to proper compensation, and was alarmed by potential threats to veterans' pensions. Devlin flourished as chair of the Select Committee on Animal Welfare from August 1989 until the end of his term. A keen follower of horse racing, he disagreed with the practice of racing young horses competitively before they had fully matured. He travelled the country as a member of the Select Committee on the Administration of Aboriginal Affairs, and supported the establishment of the Aboriginal and Torres Strait Islander Commission. Devlin grew disillusioned with what he saw as lies under parliamentary privilege, especially at the expense of the union movement, and with senatorial waffling and repetitive speeches. In 1986 and again in 1988, Devlin was attacked for living in a subsidised council apartment in Burnie, but argued that he had tried for some time to buy it. 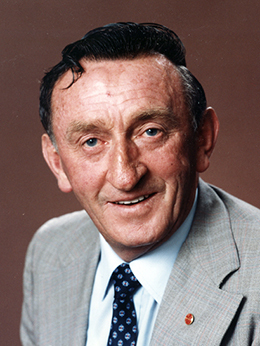 His first term as a senator cut short by the simultaneous dissolution of the Houses on 5 June 1987, Devlin was elected for only a three year term at the subsequent election. He was prevented by the ALP's age-limit provisions from seeking another term in 1990, and retired reluctantly from the Senate. He continued as secretary of the BTLC, retiring in 1993 after twenty-seven years of unbroken office. On 17 May 1995 Devlin died of cancer at his home in Burnie. He was survived by his wife Vurlie, who had worked hard for the cause at his side, a son by a previous marriage, and two step-children. His funeral service at St George's Anglican Church, Burnie, was widely attended by those who recognised not only his union and political work but also his sporting prowess as a runner, boxer, and footballer for the Burnie Tigers and the Montello Maulers. As a boxing coach with the Burnie Police and Citizens Boys' Club, he achieved considerable local success. Ray Devlin was widely respected as a genuine working-class politician. He represented the developmental wing of the Tasmanian Labor Party, with a particular interest in forestry. In 1990 he said: 'We should all be concerned about the environment, but we must also be concerned about providing employment for future generations'. He was especially disappointed at the failure of the Wesley Vale pulp mill project, targeted by conservationists in 1988 and 1989. When Labor made an accord with the Tasmanian Green Independents in May 1989 his wife Vurlie left the party. Devlin did not go as far, but later, during the Franklin Dam controversy, he won the respect and friendship of former Liberal premier Robin Gray, a strong opponent of the Greens. Sunday Tasmanian (Hob. ), 30 July 1989, p. 19; CPD, 17 April 1985, pp. 1111–15, 29 May 1995, pp. 455–7; Richard Davis, Eighty Years' Labor: The ALP in Tasmania, 1903–1983, Sassafras Books and the History Department, UTAS, Hob., 1983; Advocate (Burnie), 13 April 1984, p. 3, 1 July 1993, p. 1, Sunday Tasmanian (Hob.) 20 June 1993, p. 23; Examiner (Launc. ), 12 April 1975, p. 1, 25 Nov. 1975, p. 11, 2 Sept. 1983, p. 25, 20 May 1995, p. 13; Renfrey Clarke, The Picket, Pathfinder Press, Chippendale, NSW, 1984. Sunday Tasmanian (Hob. ), 17 June 1990, p. 12; CPD, 29 May 1995, p. 457, 17 April 1985, pp. 1111–15. CPD, 17 Nov. 1987, pp. 1888–90, 27 Feb. 1985, p. 238, 12 Sept. 1985, p. 502, 14 Oct. 1985, p. 1134, 18 Sept. 1986, pp. 596–7, 2 April 1987, p. 1728, 9 Oct. 1985, p. 894; Senate Select Committee on Animal Welfare, Interim Report on the Racing Industry, June 1990; CPD, 28 Feb. 1989, pp. 52–4, 23 Aug. 1990, pp. 2090–1, 18 Aug. 1989, pp. 397–8; Sunday Examiner (Devonport), 25 May 1986, p. 1; CPD, 12 Oct. 1988, pp. 1259–60. Advocate (Burnie), 27 June 1990, p. 3, 19 May 1995, p. 5, 23 May 1995, p. 4; 'Profile: Senator Roy [sic] Devlin', House Magazine, 26 Nov. 1986, p. 3. This biography was first published in The Biographical Dictionary of the Australian Senate, Vol. 4, 1983-2002, Department of the Senate, Canberra, 2017, pp. 358-360.